This article is about a town in Sarawak, Malaysia. For the administrative district, see Bintulu District. For the administrative division, see Bintulu Division. For the federal constituency represented in the Dewan Rakyat, see Bintulu (federal constituency). Bintulu /biːnˈtuːluː/ (Chinese: 民都魯; pinyin: Míndūlǔ; Pe̍h-ōe-jī: Bîn-to͘-ló͘) is a coastal town on the island of Borneo in the central region of Sarawak, Malaysia. Bintulu is located 610 kilometres (380 mi) northeast of Kuching, 216 kilometres (134 mi) northeast of Sibu, and 200 kilometres (120 mi) southwest of Miri. With a population of 114,058 as of 2010, Bintulu is the capital of the Bintulu District of the Bintulu Division of Sarawak, Malaysia. The name of Bintulu was derived from the local native language "Mentu Ulau" (picking heads). Bintulu was a small fishing village when Rajah James Brooke acquired it in 1861. Brooke later built a fort there in 1862. In 1867, the first General Council meeting (now Sarawak State Legislative Assembly) was convened in Bintulu. It is the earliest state legislature system in Malaysia. The construction of the earliest airstrip in Bintulu began in 1934 but was halted in 1938 due to financial difficulties. During World War II, the airstrip was heavily bombed by Allied forces. The British later rebuilt the airstrip, and it became fully operational in 1955. The old airport was replaced by a new airport in 2002. Bintulu remained a fishing village until 1969 when oil and gas reserves were discovered off the coast. Since then, Bintulu has become the centre of energy intensive industries such as a Malaysia LNG plant, a Shell Middle Distillate Synthesis plant, and a Bintulu combined cycle power plant. The economy has also expanded into oil palm and forest plantations, palm oil processing, wood-waste processing, and cement manufacturing. The port of Bintulu is the busiest in Sarawak. The town is also a gateway to Samalajau Industrial Park. 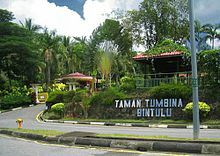 Among the tourist attractions in Bintulu are Similajau National Park, Tumbina Park, Tanjung Batu beach, Jepak village, Kuan Yin Tong temple, Assyakirin mosque, Council Negri monument, Tamu Bintulu, and Pasar Utama markets. The Borneo International Kite Festival is held annually in the town. During the 16th century, Bintulu was named "River de Burulu" by Portuguese cartographers. There are several legends surrounding the name Bintulu. During the Brooke dynasty, the indigenous practised headhunting to maintain their social status in the community. They threw the heads into the Kemena River, after which the heads had to be collected from the river. The practice of collecting the heads was known as "Mentu Ulau" (picking heads) in the local native language. Another story relates that two Iban warriors named Berengik and jaleb built houses along the river. They and their followers frequently carried out preservation of severed heads near a small river stream branching off from Sebezaw River because the river bank was flat and wide. Therefore, the small river stream was named "Mentu Ulau" river. Outsiders who came to Bintulu subsequently pronounced the name as "Mentulau", and later the name evolved into "Bentulu" and, finally, "Bintulu". The fort of Bintulu which was built entirely of wood, was in somewhat ruinous condition. It stood nearly on the sea-shore, and just behind it, at a distance of few paces, the primeval forests commenced...Some chinamen had settled at the vicinity of the fort and had built a small bazaar; but the village is chiefly formed by the houses of the Melanau beyond the Chinese kampong (village). These Melanaus used to live further up the river, but since the construction of the fort, and the installation of an officer of the Rajah near the mouth of the river, they came to settle near the sea – a thing they would never have dared to do in former days for fear of the attacks of the Lanun pirates and Dayak pirates. The houses of the Melanau people were built in rows on both sides of the Kemena River, mostly furnished by Nipah and Sago palms. Each house had its own shed projection into the entrance of the river, which was used for the processing of Sago palms. On 8 September 1867, the first Sarawak General Council meeting (now Sarawak State Legislative Assembly) took place here. It was made up of 21 elected local community members (five British officers and 16 Malay and Melanau local chiefs). The Council was formed by Raja Muda Charles Brooke under orders from Rajah James Brooke. The Council is the oldest state legislative assembly in Malaysia. During World War II, Rajah Charles Vyner Brooke ordered the construction of airstrips in Kuching, Oya, Mukah, Bintulu, and Miri. Construction of the Bintulu airstrip was started in 1934 under the direction of C. W. Bailey, a Works and Building Inspector for the British Royal Air Force (RAF). All the airstrips were completed except for the Bintulu airstrip, where construction was discontinued in October 1938 due to financial reasons. Japanese forces landed in Miri on 16 December 1941. Sarawak fell into Japanese hands when they conquered Kuching on 24 December 1941. When the Japanese invaded Sarawak, Charles Vyner Brooke already left for Sydney (Australia) before the attack while his officers were captured by the Japanese and interned at the Batu Lintang camp. During the Japanese occupation, the Japanese used the airstrip for military purposes. However, the airstrip was heavily bombed by Allied forces. The British began reconstruction of the airstrip after the war; during the project many unexploded bombs were unearthed. On 5 September 1942, Japanese Field Marshal Prince Maida (前田利为) boarded a plane from Kuching to Labuan to officiate an airport that bears his name. However, he never arrived. One month later, the plane was found to have crashed off the coast of Tanjung Batu, Bintulu. The cause of the plane crash was not known. The Japanese later set up a wooden pole memorial made up of Belian wood in Bintulu. The wooden pole was later taken back to Japan by the family of Prince Maida. Chinese sawmill owners at Sibu and Bintulu were instructed by the Japanese to produce timber for repairs at oil fields and ship building. During the Japanese occupation, sawmills at Bintulu produced a total of 4,000 tons of sawn timber. Bintulu fishing village in the 1950s. Behind the fishing village was the airstrip. Aerial view of Bintulu town in 1950s. Bintulu airstrip can be seen at the top left corner of the image. In the 1950s, major economic activities in Bintulu were the timber extraction industry, fishing, and Sago processing. In the 1960s, Bintulu was still a small fishing village, with a population of 5,000. No roads were constructed in Bintulu until 1969 when the first untarred road was built to connect Bintulu to Miri. The first bus that serviced the Miri–Bintulu route was owned by Majlis Amanah Rakyat (MARA). The MARA bus line was an initiative by the Malaysian federal government to provide public transportation for the people. The Iban villagers paid the bus driver with "vegetables, chickens, bamboo shoots, and other items". Before 1960, Bintulu was connected to Kuching by sea through a ship named "Swee Joo". After 1960, the ship "Chin Chin" was added to the route. It took around 36 to 48 hours to reach Bintulu from Kuching, depending on the sea conditions. Due to lack of food supplies from Kuching, the villagers had to make do with limited food, and several villagers resorted to hunting in the jungles to supplement the food supply. In 1960 there were only three primary schools in Bintulu. These schools provided classes until Primary 3 level. There were no secondary schools. Villagers could pursue their secondary school studies at either Miri or Kuching by using small boats as there were no roads connecting Bintulu to either Miri or Kuching. Bintulu Government Secondary School was opened in 1964. In 1967 Bintulu celebrated the first 100 years of the Council Negri meeting (Sarawak State Legislative Assembly). A stone monument was built in front of a government rice storeroom to commemorate the event. 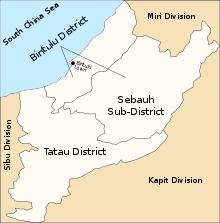 Bintulu was a sub-district of Miri Division in the 1970s. The sub-district was upgraded into a district in 1987. Large reserves of natural gas were discovered off the coast of Bintulu in 1969. Following this, a feasibility study was done in 1975, and Tanjung Kidurong was found to be a suitable site for a deep-water port. On 14 June 1978, Malaysia LNG Sdn Bhd (MLNG Satu) was established by Petronas, a Malaysian national oil and gas company for Liquefied Natural Gas (LNG) processing at Bintulu. On 8 July 1978, the Bintulu Development Authority (BDA) was established by the Sarawak state government for infrastructure development and to promote industrial investment in the area. On 15 August 1981, the Bintulu Port Authority was established at Tanjung Kidurong, starting operation on 1 January 1983. Since the establishment of Sarawak Corridor of Renewable Energy (SCORE) in 2008, Bintulu become the gateway to Samalajau Industrial Park, which is located 62 kilometres (39 mi) away from Bintulu. The industrial park is a centre of heavy, energy-intensive industry. Among the companies that started their operations in the industrial park are Tokuyama Malaysia Sdn Bhd, Press Metal Bintulu Sdn Bhd, and OM Materials Sdn Bhd. Rural–urban migration is significant in Bintulu because of greater job availability in the town. Since 2007, new residents have started several squatter areas in Bintulu due to inability to find affordable housing, around Kidurong Industrial estate and Sungai Sebatang. To address the issue, several low-cost housing projects were initiated by BDA and Sarawak state government to relocate the squatters. The state government planned to achieve zero squatters status by the year 2020. Bintulu also saw the rise in the number of residential and commercial properties such as double-storeyed terraced houses, terraced shopoffices, Kidurong Commercial Centre, and Time Square Shopping Mall. Residential properties has shown a 20% price increase from 2011 to 2013. Bintulu is represented by Bintulu parliamentary seat (P. 217) in the Parliament of Malaysia. The town is also represented by three state assembly seats – Jepak, Kidurong (later was split by two state assembly namely Tanjong Batu and Samalaju), and Kemena – in the Sarawak State Legislative Assembly. 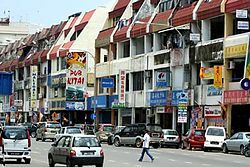 Since 1978 the town of Bintulu has been administered by the Bintulu Development Authority (BDA), with offices located along Jalan Tanjung Kidurong. The town is located within the boundary of Bintulu District, with a population of 183,402 and a total area of 7,220.40 square kilometres (2,787.81 sq mi). Bintulu Division was formerly a Bintulu District under the jurisdiction of Miri Division. The former Bintulu District was upgraded to Bintulu Division on 1 January 1987. At the same time, Bintulu sub-district was upgraded to the present-day Bintulu District. Both the Bintulu Resident and District offices are located inside Wisma Residen, Pisang Keling Street, Bintulu. 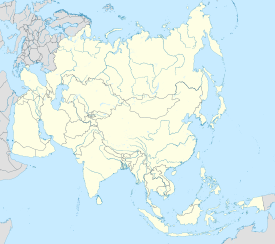 Bintulu is located 610 kilometres (380 mi) northeast of Kuching 216 kilometres (134 mi) northeast of Sibu, and 200 kilometres (120 mi) southwest of Miri. Bintulu is located near the mouth of the Kemena River, in the coastal region of central Sarawak. Geology of the coastal area was formed during the Pleistocene period; silt, clay, and gravel can be found here. Geological formation from the Oligocene period is found in the inland area, which contains limestone, siltstone, and sandstone. The soil is generally soft. There are two monsoon seasons in the Bintulu: the northeast moonsoon (November to March) and the southwest moonsoon (May to September). The calm period between these two moonsoons is known as the transitional period. In the coastal region, maximum rainfall occurs in the month of January, while minimal rainfall occurs from the period June to August. Rainfall is more evenly distributed in the inland areas. The annual rainfall of the Bintulu region is about 3,750 mm (148 in) annually. The mean daily hours of sunshine at Bintulu is about 5.0 to 5.5 hours. Bintulu receives on average 14 to 15 mJ/m2 of radiation throughout the year. Bintulu's relative humidity is 85%. The issue of gangsters in Bintulu was first raised in 2007 by the member of parliament (MP) for Bintulu. The gangsters may have run businesses related to illegal logging, controlling the prices of diesel, eggs, fertiliser and gas cylinders. Bintulu police have been cracking down on gangster activities in the town. Unscrupulous businessmen who seek cheap labour have caused a rise in the number of illegal immigrants in Bintulu. The number may have reached 50,000 in 2009. Bintulu immigration department has performed several operations to deport illegal immigrants back to their home country. As of the 2010 Malaysian census, the population of the town of Bintulu is 114,058. Indigenous people accounted for the largest proportion of the town population (61.2%, 69,782), followed by Chinese (25.0%, 28,512), Non-Malaysians (13.1%, 14,939), and Indians (0.3%, 319). Among the indigenous groups, there are Iban (32,992), Malay (14,945), Melanau (14,179), Bidayuh (1,598), and other indigenous tribes (6,068). According to government sources, there are 229 Iban longhouses in the Bintulu District. The Ibans moved into Kemena and Tatau basins in the mid-19th and early 20th century with permission of the Brooke government. Other indigenous tribes that form the minority are Kayan, Kenyah, and Punan. The Chinese in Bintulu are mainly composed of dialect groups such as Hakka, Fuzhou, and Teochews. The Chinese have been living in the town of Tatau since the era of Bruneian Empire. Later, Fuzhou Chinese from Sibu moved in, dominating the timber and plantation businesses in Bintulu. There is also a large number of foreigners working there. Most of them come from Britain, Australia, the Netherlands, Germany, South Africa, New Zealand, Japan, China, the United States, and Indonesia. While Malay is the official language of Sarawak; Iban is widely spoken there. Local ethnic languages and Chinese dialects are spoken by the respective ethnic groups. Standard Chinese is also spoken by ethnic Chinese in Bintulu. Bintulu is spoken by communities living along the Kemena River, with 4,200 native speakers. These speakers are now recognised as part of the Melanau ethnic group, where their main language is Malay. Bintulu is classified as one of the endangered languages in Sarawak because of the isolated usage of the language in a small community. The majority of the Bintulu population are adherents of Christian denominations due to Christian missionaries operating during the Brooke dynasty; followed by Islam, Buddhism, and Hinduism. Among the notable places of worship in Bintulu are the Bintulu Mosque (Masjid Assyakirin), Masjid Jepak, Tua Pek Kong Temple, Eng Kwang Methodist Church, and St. Thomas Church. The respective religious groups are free to hold processions in the town. There are five industrial estates in Bintulu. They are: Kemena Industrial Estate (for wood-based industries), Jepak Industries Estate (wood-based industries), Kidurong Industrial Area (for medium and light industries), Kidurong Light Industrial Estate (medium and light industries), and Bintulu Light Industrial Estate (light industry). Malaysia LNG is a Liquefied Natural Gas (LNG) manufacturing complex located in Bintulu that currently contains eight LNG trains with a ninth one currently under construction. The complex was built by the Malaysian national oil and gas company, Petronas. The manufacturing complex has a production capacity of 25.7 million tonnes per annum. Petronas is also planning to open Floating LNG (FLNG) offshore Bintulu, which is used specifically to harvest natural gas from small and isolated gas fields. Transportation of natural gas from the neighouring state of Kimanis, Sabah, to the LNG complex at Bintulu is facilitated by a 512-kilometre (318 mi) pipeline known as the "Sabah Sarawak Gas Pipeline". Currently, 45% of Malaysian natural gas is found at Central Luconia off the coast of Bintulu. The largest importers of Malaysia LNG productions are Japan (62%), Korea (17%), Taiwan (12%), and China (9%). The Sarawak Shell Bintulu Plant (SSBP), formerly known as Bintulu Crude Oil Terminal (BCOT), was established in 1979. It consists of three crude oil storage tanks, each with a capacity of 410,000 barrels. It has three major areas of operation: Crude Oil Operations, Condensate Stabilisation, and Gas Sales Facilities. Royal Dutch Shell started to establish the world's first Shell Middle Distillate Synthesis plant (Shell MDS) in 1993. It is also known as Bintulu Gas-To-Liquid plant (Bintulu GTL). The plant has a production capacity of 14,770 barrels per day with a total investment of over US$1 billion as of the year 2010. The plant is staffed with 380 people, of whom 93% are Malaysians, with 80% of the staff coming from Sarawak. Since the opening up of the Bintulu–Miri road in the 1970s, large-scale plantations of oil palm and cocoa has been developed in rural areas of Bintulu Division. Currently, there are 57,740 hectares (577.4 km2 (223 sq mi)) of oil palm, 2,000 hectares (200 km2 (77 sq mi)) of Rattan, and 815 hectares (8.15 km2 (3 sq mi)) of pepper plantations. The first Bintulu palm oil refinery, Bintulu Edible Oil Sdn Bhd, was established in June 1991. Bintulu currently has four palm oil refineries: Bintulu Edible Oils Sdn Bhd (operated under PGEO Group, a subsidiary of Wilmar International), Sime Darby Austral Edible Oil Sdn Bhd, Kirana Palm Oil Refinery Sdn Bhd, and Sarawak Oil Palm Bhd. However, as of 2015, Wilmar no longer buys raw palm oil produced from cleared forests and peat swamps in Sarawak because of environmental concerns. The Bintulu Division has been designated as a Planted Forests Zone (PFZ) by the Sarawak state government since 1998. As of 30 June 2011, a total of 124,618 hectares (1,246.18 km2 (481 sq mi)) has been planted with acacia trees. Other trees that are planned for plantations are kelampayan, engkabang, durian, batai, eucalyptus, and rubber trees. Sarawak Planted Forest Sdn Bhd, a company wholly owned by the Sarawak state government, has been granted a license to replant forests for 60 years. However, the company has been suffering financial losses from 2009 to 2011. There are three mills in Bintulu that process wood-waste products. Two are Medium-density fibreboard (MDF) plants and the third is a charcoal briquette plant, with a total installed capacity of 246,000 cubic metres (8,700,000 cu ft) per year. MDF plants utilise wood waste purchased from sawmills and plywood mills in the Bintulu area and occasionally from the Tanjung Manis timber processing zone located at the mouth of the Rajang River. Synthetic resins, which are required to hold wood dust together, constituted 20% of the total production cost of the wood panel products. MDF plants in Bintulu are operated by Daiken Sarawak Sdn Bhd, which was founded on 15 February 1994. The briquette plant is operated by Cipta Briquette Sdn Bhd. A glue/adhesive factory in Bintulu is owned by Bintulu Adhesive & Chemicals Sdn Bhd. It produces urea formaldehyde resin and phenol formaldehyde resin for plywood and chipboard manufacturing at Kemena Industrial Estate. Urea precondensate is also produced to supply ASEAN Bintulu Fertiliser (ABF) plant. The Bintulu Port Authority was established in 1981. It started port operation in 1983 at Tanjung Kidurong. Following a privatisation exercise, Bintulu Port Sdn Bhd (BPSB) was founded on 23 December 1992 and commenced operation on 1 January 1993. BPA is currently responsible for regulatory exercises and security of the port. Meanwhile, BPSB is responsible for cargo handling at the Bintulu International Container Terminal (BICT). The port also provides Vessel traffic service to shipping vessels. The annual total cargo throughput is 45.4 million tonnes, consisting of 58% LNG and 42% non-LNG products. As of 31 December 2014, it generated a total revenue of RM 552.3 million per year. Bintulu Port is the busiest port in Sarawak. The ASEAN Bintulu Fertiliser plant is the anhydrous ammonia and granular plant operated by ASEAN Bintulu Fertiliser Sdn Bhd (ABF), which is partly owned by Petronas. The company was formed on 6 December 1980. The plant started operation on 1 October 1985. It is also one of the largest granular urea plants in Asia. It is a joint venture by five ASEAN countries: Malaysia (63.5% shares), Thailand (13%), Indonesia (13%), the Philippines (9.5%), and Singapore (1%). Cahya Mata Sarawak Berhad (CMSB), one of the largest publicly traded companies in Sarawak, set up a cement plant in Bintulu at Kidurong Industrial Estate. The plant, manned by 40 people, produces ordinary Portland cement and Portland blast furnace cement. It currently has a combined production capacity of 2.75 million MT (million tonnes). The Bintulu combined cycle power plant was started in early 2010 with a capacity of 317 megawatts. The power plant is registered under the United Nations Clean Development Management (CDM) scheme as of 18 September 2010. The plant is built to ensure efficient use of energy and reduce green house gas emissions. It is the first CDM power plant in Malaysia, currently operated by Sarawak Power Generation Sdn Bhd (SPG), a wholly owned subsidiary of Sarawak Energy. All roads in Bintulu are maintained by the Bintulu Development Authority (BDA). Bintulu is connected to Miri and Sibu by the Pan Borneo Highway. Bintulu is also connected to Mukah and Samalaju Industrial Park. Kemena Bridge crosses the Kemena River. It is the second bridge in Malaysia built using the incremental launch method. Keppel Road in Bintulu is named after a friend of James Brooke, Sir Henry Keppel. Bintulu has a long-distance bus station, located at Medan Jaya, 5 km (3 mi) northeast of the town centre. Among the areas served by the bus station are: Miri, Sibu, Kuching, Mukah, Sarikei, Oya, Dalat, Balingian, and Pontianak, Indonesia. The bus companies that serve the station are the Syarikat Baram Sdn. Bhd, MTC, Biaramas, and Suria bus lines. There are also buses that serve the town area. Taxi service is also available. The old Bintulu airport was built in 1955 in the town centre. It once held the Guinness World Record of nearest airport to town. On 19 December 2002, the airport was replaced by a new airport, which is located 23 km (14 mi) away from the town centre. The surroundings of the old airport were developed into commercial and residential projects while the runway is reserved for Bintulu International Kite Festival. The new airport has a runway measuring 2,745 m (9,006 ft), capable of handling planes as large as the Airbus A330. The airport currently serves three major airlines: Malaysia Airlines (MAS), Air Asia, and MASwings, connecting to domestic destinations such as: Sibu, Miri, Kuching, Kuala Lumpur, and Kota Kinabalu, and the first international destination, Singapore will start the direct flight since 26 Dec 2017. There is a wharf terminal at Bintulu that serves the rural areas of Bintulu Division. Among the destinations that can be reached by express boat from Bintulu are: Sebauh, Pandan, Labang, Tubau, and Binyo. The current court complex is located at Pisang Emas Road. It comprises the High Court, the Sessions Court, and the Magistrate Court. Bintulu also has Syariah Subordinate Court, located at Tanjung Kidurong, whose area of jurisdiction covers Bintulu District and Tatau districts. The Bintulu central police station is located at Tun Hussein Onn Road, with other police stations located at Tanjung Kidurong, Tubau, and Sebauh. There is also a central prison in Bintulu, which doubles as a correctional centre. Bintulu Hospital started operation in 1968. It is located at Nyabau Road, 12 km (7.5 mi) from the town centre. Following renovations completed on 21 May 2000, the hospital is now equipped with 200 beds. As of 2011, the hospital provides speciality services in seven medical disciplines. Bintulu also has one polyclinic, Polyclinic Bintulu. There are two private hospitals in Bintulu: Columbia Asia Hospital and Bintulu Medical Centre. There are about 50 primary and eight secondary schools in Bintulu. All the schools under the National Education System are managed by the Bintulu District Education Office. The oldest primary schools in Miri are St Anthony's Primary School (Roman Catholic Mission School), Chung Hua Primary School, and the Orang Kaya Mohammad Primary School, which were established in the early 1960s. The Bintulu Government Secondary School was built in 1964. It is now known as SMK Bintulu, the oldest secondary school in the town. Bintulu also has one Chinese independent school, Kai Dee Middle School (开智中学). The Shell Oil Company established the Kidurong International School in 1982 to meet the primary education needs of Shell employees' children. The school provides English National Curriculum (ENC) for literacy and numeracy and International Primary Curriculum (IPC) for other subjects. UPM Bintulu Sarawak Campus was started as the National Resource Training Centre, Kuching, in 1974. 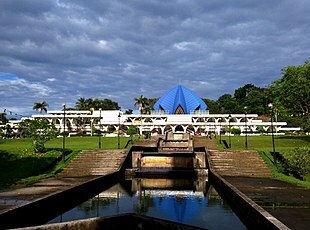 The oldest campus in Sarawak, it was relocated to Bintulu in 1987 as a branch campus of the Universiti Pertanian Malaysia (UPM). The campus was closed down in 1992 before reopening in 2001 as Universiti Putra Malaysia (UPM). During this period of closure, the campus was used as the site for Maktab Perguruan Sains Bintulu (Bintulu Science Teachers' Training College) from 1994 to July 1999 when it was moved to Kota Samarahan as Institut Pendidikan Guru Kampus Tun Abdul Razak (Tun Abdul Razak Teachers' Training Institute Campus). The UPM campus is currently located 13 km (8 mi) away from the town centre, occupying 715 ha (1,767 acres), which can accommodate up to 2,200 students. This branch campus currently has only one faculty, the Faculty of Agriculture and Food Sciences, consisting of five academic departments. In 2015 UPM was ranked 41st in the UI-Greenmetric World University rankings. SEDAMAI College, established in November 1999, offers courses in business, information technology, language, and engineering. There is also a technical school located 15 km (9 mi) away from the town, near Tanjung Kidurong, occupying 20 ha (49 acres) of land. The school was built in 1982 with a maximum capacity of 900 students. Among the courses offered are: automotive, mechanical and civil engineering, commerce, and fashion. Gulf Golden International Flying Academy (GGIFA), the first and only flying academy in Sarawak, was closed in 2012 due to financial difficulties. The first public library in Bintulu was built in 1971 by Bintulu District Council (BDC). In 1988 the library was demolished to make way for car parks. Books from the library were moved into the former BDC building. 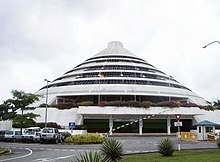 On 29 May 2000, the Bintulu Development Authority (BDA) public library was built near the Bintulu Civic Centre, which is 2 km (1.2 mi) from the town. The public library has three branches: at Kidurong, Tatau, and Sebauh. Kampung Jepak (Jepak village) is a Melanau fishing village in Bintulu located near Kemena River. Among the daily activities in this village are Sago processing, fish drying, and the manufacturing of Belacan, Cencaluk (salted shrimp), Terendak (Melanau headgear), and Tutop (a type of food cover). Kuan Yin Tong temple is located at KM2 Jalan Sultan Iskandar. It has a structural design with a rock garden courtyard, man-made waterfall, and dragon fencing. Assyakirin mosque, meaning "Gratefulness to God", has a man-made waterfall, a fountain, and a landscape planted with flowers. The Borneo International Kite Festival has been held yearly since 2005 at the old Bintulu airport runway. It usually lasts for four to five days in September. In 1987 a clock tower and a fountain were erected at Council Negri Monument. A centenary stone that was erected in 1967 to commemorate the event is kept under the clock tower. The Bintulu Tua Pek Kong temple (near Tamu Bintulu) is believed to have been built in the 1890s to purge the town from evil spirits. The temple survived World War II, and was rebuilt after the discovery of oil and gas reserves offshore. Similajau National Park is located 30 km (19 mi) northeast of the town. The park was gazetted in 1976, covering an area of 8,996 ha (22,230 acres) (89.96 km2 (35 sq mi) with sandy beaches, rocky headlands, jungle streams, and forests. Other national parks that can be accessed along the Miri–Bintulu road are the Lambir Hills National Park and Niah National Park. Tanjung Batu beach (Temasya beach) is located 3 km (1.9 mi) from the town centre. Meanwhile, Taman Tumbina (Tumbina Park) is located 4 km (2.5 mi) from the town centre. The park has a hornbill aviary, a butterfly garden, and a mini-zoo. Kidurong Tower is an observation tower located at Tanjung Kidurong. It offers a view of the Bintulu oil and gas facilities shortly after nightfall. Bintulu Promenade is a 3-kilometre (2 mi) walkway along the Bintulu coastline with the Kemena River mouth as its focal point. It has the observation points offering sunset views. There is also an 18-hole golf course at Bintulu. 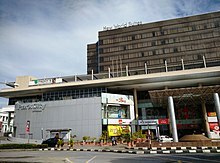 There are several shopping malls in Bintulu: The Spring Bintulu, Bintulu Times Square, Commerce Square Bintulu, Bintulu Paragon, ParkCity Mall and City Point. . The Spring Bintulu Mall is the latest attraction of list of malls in Bintulu. Furthermore, with the construction of Bintulu Paragon at the old airport will boost Bintulu economy. Tamu Bintulu and Pasar Utama are the two main markets in the town. Both places have a unique cone-shaped roof that symbolises the traditional Melanau headgear named Terendak. Tamu Bintulu offers items ranging from jungle produce to native home-made specialties such as Belacan. Meanwhile, Pasar Utama houses both wet market and dry market under one roof, providing fresh vegetables, fruits, fish, and dairy products. The first floor of Pasar Utama offers a variety of fast food such as Laksa, Kolok Mee, Jawa Mee, Pulut Panggang, ais batu campur, cendol and teh tarik. The Bintulu night market is located on Kampung Dagang road. There are over 150 stalls selling a variety of items such as garments, electric goods, vegetables, fruits, food and drinks. ^ a b "Melanau association resents Bintulu being called 'poor town'". The Borneo Post. 2 September 2012. Archived from the original on 8 September 2012. Retrieved 1 June 2015. Bintulu is the energy town that has become the biggest provider of the nation’s wealth. ^ "Message from General Manager". Bintulu Development Authority. Retrieved 31 May 2015. ^ "About Us". Bintulu Development Authority Official Website. Bintulu Development Authority Official Website. 5 September 2014. Retrieved 7 September 2014. ^ "Malaysia Elevation Map (Elevation of Bintulu)". Flood Map : Water Level Elevation Map. Archived from the original on 23 August 2015. Retrieved 23 August 2015. ^ "Population Distribution by Local Authority Areas and Mukims, 2010 (page 10)" (PDF). Department of Statistics, Malaysia. Archived from the original (PDF) on 5 February 2015. Retrieved 19 March 2015. ^ a b c d "Population Distribution by Local Authority Areas and Mukims, 2010 (Page 158, under Bintulu Townland)" (PDF). Statistics Department, Malaysia. December 2011. Archived from the original (PDF) on 14 November 2014. Retrieved 19 July 2013. ^ "Bintulu, Bintulu – Postcode – 97000". postcode.my. Archived from the original on 29 March 2015. Retrieved 20 July 2015. ^ "Sarawak Energy Station Addresses". Sarawak Energy Berhad. Archived from the original on 25 July 2013. Retrieved 20 July 2015. ^ "Penyelidikan dan kajian dijalankan untuk mendokumentasi sejarah Bintulu (Research and studies conducted to document the history of Bintulu)" (in Malay). The Borneo Post. 23 October 2012. Archived from the original on 5 June 2015. Retrieved 5 June 2015. ^ De Ledesma, Charles; Lewis, Mark; Savage, Pauline (2003). Malaysia, Singapore, and Brunei. Rough Guides. p. 459. Retrieved 5 April 2016. The name "Bintulu" is, in fact, derived from the Malay "Menta Ulau" – "the place for gathering heads"; before Bintulu was bought by Charles Brooke from the Sultan of Brunei in 1853, Melanau pirates preyed on the local coast, attacking passing ships and decapitating their crews. ^ "Bintulu di hatiku – Sejarah (Bintulu in my heart – History)" (in Malay). Cats FM blog. Archived from the original on 5 June 2015. Retrieved 5 June 2015. ^ a b "History". Bintulu Development Authority (BDA). Retrieved 1 June 2015. ^ "Chronology of Sarawak throughout the Brooke Era to Malaysia Day". The Borneo Post. 16 September 2011. Archived from the original on 6 February 2015. Retrieved 1 June 2015. ^ Bakar, Lamah (1 March 2011). "The story behind the state's streets and roads". The Star (Malaysia). Archived from the original on 7 February 2015. Retrieved 3 June 2015. ^ a b c Beccari, Odoardo (1904). Wanderings in the Great Forests of Borneo. London: Archibald Constable & Co Ltd. pp. 242, 256, 257. Retrieved 4 June 2015. ^ a b c d e f g "Bintulu – Places of Interest". Bintulu Development Authority. Archived from the original on 19 November 2016. Retrieved 19 July 2015. ^ "Hot Spots". isarawak.com.my. Archived from the original on 4 March 2016. Retrieved 1 June 2015. ^ L, Klemen (1999–2000). "The Invasion of British Borneo in 1942". Forgotten Campaign: The Dutch East Indies Campaign 1941–1942. Archived from the original on 1 April 2015. ^ "The Japanese Occupation (1941–1945)". The Sarawak Government. Retrieved 3 November 2015. ^ a b c d e f g h i j Mohamed, Sakina (16 September 2014). "Reminiscing the old Bintulu". The Borneo Post. Archived from the original on 31 December 2014. Retrieved 7 June 2015. ^ "松鼠助建國‧英女王巧遇哪吒‧神怪傳說豐富貓城 (The squirrel that helped to build the country – British Queen encountered Nezha by chance – Legend of the genie – Rich cat city)" (in Chinese). Guang Ming Daily (Malaysia). Archived from the original on 7 June 2015. Retrieved 7 June 2015. ^ "当年浮罗岸地标 – 华侨青年社 变娥殿大戏院 (The then Padungan landmark was the Chinese Youth Community Centre before it became DEON Cinema.)". International Times (Sarawak). Archived from the original on 24 January 2013. Retrieved 7 June 2015. ^ "The Sarawak Gazette" (PDF). LXXIV (1083). 1 June 1948: 122. Retrieved 7 June 2015. Shortly afterwards, Field Marshal Prince Maida, cousin of the Emperor Sun God and Generalissimo, fell miserably to earth in a crashed plane somewhere around Miri. ^ Yussop, Mahmud. "My Bintulu History". My Bintulu History. Archived from the original on 7 June 2015. Retrieved 7 June 2015. ^ Ooi, Keat Gin (2010). The Japanese Occupation of Borneo, 1941–1945. Routledge. Retrieved 7 June 2015. ^ a b "Sejarah Penubuhan Pejabat Residen Bintulu (History of formation of Bintulu Resident Office". Bintulu Resident Office. Archived from the original on 23 September 2015. Retrieved 17 June 2015. ^ "Petronas MLNG – Our History". Petronas MLNG. Archived from the original on 29 March 2015. Retrieved 6 April 2016. Our journey began on 14 June 1978, when PETRONAS, Shell BV and Mitsubishi secured a partnership agreement to undertake Malaysia's first LNG project. This momentous collaboration led to the birth of Malaysia LNG Sdn. Bhd. (MLNG). We were involved in every aspect of the project in Bintulu – from the plant, jetty and infrastructure construction to the acquisition of LNG carriers and training of human resource. ^ "About Us". Bintulu Development Authority. Retrieved 10 June 2015. ^ "Bintulu Port celebrated 25th anniversary". ASEAN Ports Association. 29 August 2008. Archived from the original on 10 June 2011. Retrieved 10 June 2015. ^ "Bintulu's Kidurong area sees increasing demand in industrial projects from SCORE". The Borneo Post. 24 March 2014. Archived from the original on 13 June 2015. Retrieved 13 June 2015. ^ "Samalaju Industrial Park, Bintulu". Sarawak Corridor of Renewable Energy. Archived from the original on 13 November 2013. Retrieved 13 June 2015. ^ Yussop, Yunus (13 February 2014). "Work on Samalaju Port on track". The Borneo Post. Archived from the original on 9 March 2014. Retrieved 13 June 2015. ^ Tony, Thein (4 August 2007). "Bintulu squatters: Please give us housing". Malaysiakini. Archived from the original on 27 March 2016. Retrieved 27 March 2016. ^ Munan, Sidi (13 January 2013). "Squatters‍—‌a problem solved?". The Borneo Post. Archived from the original on 12 June 2015. Retrieved 12 June 2015. ^ "3,000 squatters in Bintulu in dire straits". The Borneo Post. 3 March 2011. Archived from the original on 12 June 2015. Retrieved 12 June 2015. ^ Enjane Bali, Josephine (24 October 2014). "SUPP Bintulu holds dialogue with Sg. Sebatang squatters". New Sarawak Tribune. Archived from the original on 12 June 2015. Retrieved 12 June 2015. ^ Yussop, Yunus (13 June 2013). "State to build 50,000 affordable houses in 5 years‍—‌Abg Johari". The Borneo Post. Archived from the original on 12 June 2015. Retrieved 12 June 2015. ^ Yussop, Yunus (2 April 2014). "BDA to help govt achieve zero squatters". The Borneo Post. Archived from the original on 12 June 2015. Retrieved 12 June 2015. ^ Salena, Pail (22 January 2015). "Zero squatters by 2020, says Abang Johari". The Borneo Post. Archived from the original on 8 August 2015. Retrieved 27 March 2016. ^ "Bintulu arising, thrice lucky". Daily Express. 19 January 2015. Archived from the original on 20 June 2015. Retrieved 27 March 2016. ^ "Bintulu property market sees strong growth this year". New Sarawak Tribune. 6 February 2013. Archived from the original on 27 March 2016. Retrieved 27 March 2016. ^ "Senarai Bahagian-Bahagian Pilihan Raya Parlimen dan DUN Setiap Negeri-Negeri (List of electoral areas for parliament and state assemblies in each state)". 1klik. Jabatan Penerangan Malaysia (Department of Information Malaysia). Archived from the original on 12 February 2015. Retrieved 3 September 2016. ^ "BDA Contact Address". Bintulu Development Authority. Retrieved 17 June 2015. ^ "Hubungi Kami (Contact Us)". Bintulu District Office. Archived from the original on 23 September 2015. Retrieved 17 June 2015. ^ "Hubungi Kami (Contact Us)". Bintulu Resident Office. Archived from the original on 23 September 2015. Retrieved 17 June 2015. ^ "Kuching to Bintulu, Sarawak, Malaysia". Google Maps. Retrieved 5 June 2015. ^ "Sibu to Bintulu, Sarawak, Malaysia". Google Maps. Retrieved 5 June 2015. ^ "Miri to Bintulu, Sarawak, Malaysia". Google Maps. Retrieved 5 June 2015. ^ "Bintulu". Sarawak Tourism Board. Archived from the original on 31 March 2015. Retrieved 18 June 2015. ^ a b "Preliminary environmental impact assessment (PEIA) Study for The Proposed New Samalaju Port at Similajau, Bintulu, Sarawak" (PDF). Chemsain Konsultant Sdn Bhd. Archived from the original (PDF) on 24 June 2015. Retrieved 24 June 2015. ^ "Bintulu Climate Normals 1961–1990". National Oceanic and Atmospheric Administration. Retrieved 24 March 2015. ^ "Klimatafel von Bintulu / Insel Borneo (Kalimantan) / Malaysia" (PDF). Baseline climate means (1961-1990) from stations all over the world (in German). Deutscher Wetterdienst. Retrieved 10 June 2016. ^ "Station Bintulu" (in French). Meteo Climat. Retrieved 10 June 2016. ^ "Oil and gas industry biggest contributor to Bintulu's success". The Star (Malaysia). 31 October 2011. Archived from the original on 27 March 2016. Retrieved 27 March 2016. ^ a b c d "Sarawak's Industrial City – Bintulu (page 2 and 12)" (PDF). Sarawak, Malaysia: CH Williams Talhar Yong & Yeo Sdn. Bhd. 26 June 2004. Archived from the original (PDF) on 9 June 2015. Retrieved 9 June 2015. ^ "Police closing in gangsters". New Straits Times. 8 June 2007. Archived from the original on 5 May 2016. Retrieved 27 March 2016. These include the notorious Sungei Merah, Kong Pia, Hua Kee (Sibu), Taxi Station (Miri), Market (Kuching), Ah Seng (Sarikei) and Tua Chek (Bintulu) gangs. ^ "'Don't make Bintulu a Mafia town'". The Borneo Post. 3 December 2012. Archived from the original on 27 July 2013. Retrieved 27 March 2016. ^ "Gan: Police have leads in Bintulu crime activities". The Borneo Post. 9 July 2015. Archived from the original on 24 January 2016. Retrieved 27 March 2016. ^ "Sarawak deports 513 illegals". The Borneo Post. 9 July 2015. Archived from the original on 29 June 2015. Retrieved 27 March 2016. ^ "Bintulu has more than 50,000 illegal immigrants says Resident". Bintulu Weekly. 1 January 2009. Archived from the original on 27 March 2016. Retrieved 27 March 2016. ^ "Review existing laws to curb illegals in Bintulu". The Sun Daily. 3 March 2015. Archived from the original on 4 February 2016. Retrieved 27 March 2016. ^ Yunus, Yussop/ (3 October 2013). "'Ops Selera' nets 78 illegal immigrants". The Borneo Post. Archived from the original on 8 October 2013. Retrieved 27 March 2016. ^ Kato, Yumi; Samejima, Hiromitsu; Soda, Ryoji; Uchibori, Motomitsu; Okuno, Katsumi; Ishikawa, Noboru. "Ethnoscape of Riverine Society in Bintulu Division". Centre of Southeast Asian Studies Kyoto University. Retrieved 26 June 2015. The rest of this article provides concise introductions of ethnic groups in Bintulu, such as the Iban, Kayan, Kenyah and Punan (Fig. 3). ^ a b c "Bintulu". Shell – Global Outpost Services. Archived from the original on 26 June 2015. Retrieved 26 June 2015. ^ Blust, Robert A. (October 1973). "The origins of Bintulu 6, d1". Bulletin of the School of Oriental and African Studies. Cambridge University Press. 36 (3): 603–620. doi:10.1017/S0041977X00119871. Retrieved 27 June 2015. ^ "Bintulu-Language metadata description". endangered languages.com. Endangered Languages Project. Archived from the original on 27 June 2015. Retrieved 27 June 2015. ^ Lewis, M. Paul; Gary F, Simons; Charles D., Fanning (2015). "Ethnologue: Languages of the World, Eighteenth edition – Bintulu – A language of Malaysia". ethnologue.com. SIL International. Archived from the original on 26 June 2015. Retrieved 27 June 2015. ^ "Sarawak worship places – Bintulu". bombasticborneo.com. Archived from the original on 5 April 2015. Retrieved 27 June 2015. ^ a b Yussop, Yunus (29 January 2012). "A proud landmark in Bintulu". The Borneo Post. Archived from the original on 5 February 2012. Retrieved 27 June 2015. ^ "恩光堂 Eng Kwang Methodist Church". sarawakmethodist.org. Archived from the original on 27 June 2015. Retrieved 27 June 2015. ^ "Place of Worship in Bintulu". mygola.com. Archived from the original on 27 June 2015. Retrieved 27 June 2015. ^ Enjane Bali, Josephine (16 December 2013). "About a thousand partake in Christmas processions". New Sarawak Tribune. Archived from the original on 3 July 2015. Retrieved 3 July 2015. ^ "Maulidur Rasul procession to be held on 14 January". New Sarawak Tribune. 11 January 2014. Archived from the original on 3 July 2015. Retrieved 3 July 2015. ^ "Industrial Estate by Division". sarawak.gov.my. Official website of the Sarawak Government. Archived from the original on 15 March 2015. Retrieved 3 July 2015. ^ "JGC Malaysia Wins LNG Plant Rejuvenation Project in Malaysia". 5 March 2014. Archived from the original on 9 May 2015. Retrieved 3 July 2015. ^ "A mountain of a project: the Sabah Sarawak Gas Pipeline". Pipelines International. Archived from the original on 14 September 2014. Retrieved 3 July 2015. ^ a b Tuah, Yvonne (20 October 2013). "Gas: Fueling the future of energy". The Borneo Post. Archived from the original on 24 October 2013. Retrieved 3 July 2015. ^ a b c d e f g h "Bintulu Development Authority Official Website – Projects". bda.gov.my. Bintulu Development Authority (BDA). Archived from the original on 4 July 2015. Retrieved 3 July 2015. ^ Robert, Rapier (14 November 2010). "Inside Shell's Bintulu GTL Plant". Energy Trends Insider. Archived from the original on 26 July 2014. Retrieved 3 July 2015. ^ "PGEO Group – Commitment towards excellence". PGEO Group. Archived from the original on 15 March 2015. Retrieved 6 July 2015. ^ Tugan, Molly (23 October 2013). "Bintulu Port holds discussion with palm oil refinery reps". New Sarawak Tribune. Archived from the original on 6 July 2015. Retrieved 6 July 2015. ^ Davidson, Desmond (14 February 2014). "Singapore-based refinery will no longer buy Sarawak's palm oil, says Masing". The Malaysian Insider. Archived from the original on 2 March 2014. Retrieved 6 July 2015. ^ "PERKASA – Sarawak Timber Industry Development Corporation (April–June 2011 newsletter)" (PDF). Sarawak Timber Industry Development Corporation (STIDC). Archived (PDF) from the original on 18 June 2015. Retrieved 3 September 2016. The designation of Bintulu Division as the Planted Forest Zone (PFZ) manifests the government’s commitment in realising its objective to establish one million hectares of planted forests by 2020. ^ Cheng, Lian; Yap, Joanna (20 July 2012). "'Matured Acacia unharvested due to absence of pulp mill'". The Borneo Post. Archived from the original on 18 June 2015. Retrieved 18 June 2015. ^ "Sarawak Planted Forest Sdn Bhd". bintulubiz.com. Archived from the original on 24 April 2015. Retrieved 18 June 2015. ^ "A-G gives thumbs down to loss-making state-owned company". The Star (Malaysia). 4 December 2013. Archived from the original on 18 June 2015. Retrieved 18 June 2015. ^ a b "PRE-FEASIBILITY STUDY ON A PROPOSED WOOD WASTE BASED POWER AND HEAT PLANT IN BINTULU, SARAWAK" (PDF). Sarawak: Eco-Ideal Consulting Sdn Bhd. April 2006. pp. 34-. Archived from the original (PDF) on 3 July 2015. Retrieved 3 July 2015. In Bintulu, 3 major mills are established which convert wood waste into products (Table 8). Among these, 2 are medium density fibreboard (MDF) plants and one is a charcoal briquette plant with a total installed capacity of 246,000 m3/year. ^ "Company Profile: Daiken Sarawak Sdn Bhd". wesleynet.com. Archived from the original on 3 July 2015. Retrieved 3 July 2015. ^ "Corporate Milestones". Bintulu Port Sdn Bhd. Archived from the original on 5 July 2015. Retrieved 5 July 2015. ^ "Sejarah Lembaga Pelabuhan Bintulu (The History of Bintulu Port Authority)". bpa.gov.my (in Malay). Bintulu Port Authority. 8 April 2013. Archived from the original on 9 July 2014. Retrieved 5 July 2015. ^ "Bintulu Port aims to cut dependency on LNG business via new projects". The Star (Malaysia). 22 April 2014. Archived from the original on 5 July 2015. Retrieved 5 July 2015. ^ Wong, Jack (29 April 2015). "Six Bintulu Port projects planned". The Star (Malaysia). Archived from the original on 1 May 2015. Retrieved 5 July 2015. ^ "'Transport Ministry has spent RM150 mln on Bintulu Port'". The Borneo Post. 21 April 2015. Archived from the original on 20 July 2015. Retrieved 20 July 2015. For now, Bintulu Port is the largest port in Sarawak, but I think Samalaju Port can overtake it in years to come. ^ "Asean Bintulu Fertilizer Sdn Bhd". Petronas. Archived from the original on 25 March 2015. Retrieved 3 July 2015. ^ "Cement production at Bintulu plant returns to normal". The Borneo Post. 9 April 2015. Archived from the original on 5 July 2015. Retrieved 5 July 2015. ^ "Sarawak Energy – About Hydropower – Fact sheets". Sarawak Energy Berhad. Archived from the original on 7 July 2015. Retrieved 7 July 2015. During the first quarter of 2010 the Bintulu combined cycle project, with a combined capacity of 317MW, was successfully commissioned. The Bintulu plant was registered with the United Nations under the Clean Development Management (CDM) scheme on 18 September 2010. The CDM scheme is part of the Kyoto Protocol environmental agreement and aims to encourage sustainable development and reduce greenhouse gas emissions. The Bintulu facility is the first CDM plant in Malaysia. ^ "Project 2594 : Bintulu Combined-Cycle Project STG Unit No. 9, Tanjung Kidurong, Bintulu, Sarawak". United Nations Framework Convention on Climate Change. Archived from the original on 7 July 2015. Retrieved 7 July 2015. ^ "Miri-Bintulu Coastal Road". Jurutera Jasa Sdn Bhd. Archived from the original on 19 August 2014. Retrieved 8 July 2015. ^ "Sibu-Bintulu Roads Phase 1 and 2 (from Kemena Industrial Estate to New Bintulu Airport) and Kemena Bridge, Sarawak". Naim Holdings Berhad. Archived from the original on 8 July 2015. Retrieved 8 July 2015. ^ "Mukah-Bintulu travel time reduced once RM230mil road completed". The Star (Malaysia). 27 March 2014. Archived from the original on 8 July 2015. Retrieved 8 July 2015. ^ Yussop, Yunus (26 April 2014). "Federal government helps upgrade roads in Bintulu". The Borneo Post. Archived from the original on 8 July 2015. Retrieved 8 July 2015. ^ "Kemena Bridge, Bintulu, Sarawak". Naim Holdings Sdn Bhd. Archived from the original on 8 July 2015. Retrieved 8 July 2015. ^ Lamah, Bakar (1 March 2011). "The story behind the state's streets and roads". The Star (Malaysia). Archived from the original on 7 February 2015. Retrieved 9 July 2015. Jalan Keppel, Bintulu – Honorable Sir Henry Keppel, C.B.E (Commander of the Most Excellent Order of the British Empire) and Admiral of the Fleet was a close friend of the first and second Rajahs. ^ a b "Bintulu Online – Your Online Guide to Bintulu – Transportation". isarawak.com.my. Archived from the original on 26 February 2012. Retrieved 10 July 2015. ^ "Lonely Planet – Bintulu, Malaysia – Bus". Lonely Planet. Archived from the original on 10 July 2015. Retrieved 10 July 2015. ^ "Bintulu regional express bus terminal". etawau.com. Archived from the original on 13 July 2015. Retrieved 13 July 2015. ^ "Getting There – Land". Borneo International Kite Festival. Archived from the original on 25 June 2012. Retrieved 13 July 2015. ^ "Sarawak Taxi". bombasticborneo.com. Archived from the original on 1 July 2015. Retrieved 13 July 2015. ^ Mahmud, Yussop. "Images of Bintulu Before and Now – Old Bintulu Airport Building in 1955". blogspot.com. Archived from the original on 17 June 2015. Retrieved 10 July 2015. ^ a b "About Bintulu Airport". Malaysia Airports Holdings Berhad. Archived from the original on 20 March 2015. Retrieved 13 July 2015. ^ "WBGB Bintulu – WBGB AD 2.12 RUNWAY PHYSICAL CHARACTERISTICS" (PDF). Department of Civil Aviation, Malaysia. Archived from the original (PDF) on 28 December 2013. Retrieved 13 July 2015. ^ "Transport". Bintulu Development Authority. Retrieved 13 July 2015. ^ "Bintulu Airport Live Flight Information". ourairports.com. Retrieved 13 July 2015. ^ "How to get to Bintulu, Malaysia". journeum.com. Archived from the original on 14 July 2015. Retrieved 14 July 2015. ^ "List of Court addresses – High Court Sarawak (Kuching, Bintulu, Miri & Sibu)". CLJ Legal Network Sdn Bhd. Archived from the original on 28 February 2015. Retrieved 28 February 2015. ^ "Structure of The Court (STRUCTURE OF THE HIGH COURT IN SABAH & SARAWAK)". The High Court in Sabah and Sarawak. Archived from the original on 30 March 2014. Retrieved 10 June 2014. ^ "Bintulu – Syariah Subordinate Court". Department of Syariah Judiciary Malaysia. Archived from the original on 18 July 2015. Retrieved 18 July 2015. ^ "Direktori PDRM Sarawak – Bintulu (Royal Malaysian Police Sarawak Directory – Bintulu)". Royal Malaysian Police. Archived from the original on 29 March 2015. Retrieved 18 July 2015. ^ Zaidi, Nornasheila (3 November 2013). "Bintulu prison to be operational by early 2014". New Sarawak Tribune. Archived from the original on 18 July 2015. Retrieved 18 July 2015. ^ Johnson, K Saai (2 November 2013). "Prisons as correctional centres". The Borneo Post. Archived from the original on 18 July 2015. Retrieved 18 July 2015. ^ "Latar Belakang Hospital – Hospital background" (in Malay). Bintulu General Hospital. Archived from the original on 9 June 2015. Retrieved 18 July 2015. ^ "Specialty and Subspecialty Framework of Ministry of Health Hospitals 10 MP (2010–2015)" (PDF). Ministry of Health Malaysia. Archived from the original (PDF) on 18 March 2015. Retrieved 18 July 2015. Hospital Selayang, Hospital Sultan Abdul Halim Sungai Petani and Hospital Taiping has the highest number of services provision with 17 resident specialty and subspecialty services while Hospital Tanah Merah, Hospital Bintulu, Hospital Segamat and Hospital Kemamam is the lowest with 7 resident specialty and subspecialty services provided. ^ Yunus, Yussop (10 August 2012). "'Jamban gantung' a health nightmare – Dr Jerip". The Borneo Post. Archived from the original on 18 July 2015. Retrieved 18 July 2015. "This is because the water source is not only used by animals and human, but it is also a place where children play and bathe, and where women do their laundry and wash dishes, especially in some longhouses," he told reporters after being briefed at the new Bintulu Polyclinic on the cholera outbreak here on Wednesday. ^ "Columbia Asia Hospital Bintulu". Columbia Asia Hospital. Archived from the original on 18 May 2015. Retrieved 18 July 2015. ^ "Bintulu Medical Centre – About Us". Bintulu Medical Centre. Archived from the original on 18 July 2015. Retrieved 18 July 2015. ^ a b c "Education – Primary and secondary schools". Bintulu Development Authority. Archived from the original on 15 July 2015. Retrieved 15 July 2015. ^ "Peta lokasi pejabat (Location of the office)" (in Malay). Bintulu District Education Office. Archived from the original on 15 July 2015. Retrieved 15 July 2015. ^ "Bintulu – Kidurong International School". Global Outpost Services. Archived from the original on 29 June 2015. Retrieved 15 July 2015. ^ Ahmad Termizi, Amizul Tunizar (21 March 2014). "UPM Bintulu nadi pembangunan SCORE (UPM Bintulu is the pulse of SCORE development)" (in Malay). Utusan Malaysia. Archived from the original on 20 July 2015. Retrieved 20 July 2015. ^ "Institut Pendidikan Guru Kampus Tun Abdul Razak (Tun Abdul Razak Teachers' Training Institute Campus) – History". Tun Abdul Razak Teachers' Training Institute Campus. Archived from the original on 20 July 2015. Retrieved 20 July 2015. ^ "Welcome to the Official Portal of FACULTY OF AGRICULTURE AND FOOD SCIENCES Universiti Putra Malaysia – Footsteps". Universiti Putra Malaysia. Archived from the original on 14 July 2015. Retrieved 14 July 2015. ^ "Bintulu rejoices as UPM campus achieves green status". Daily Express (Malaysia). 21 January 2015. Archived from the original on 25 June 2015. Retrieved 14 July 2015. ^ "SEDAMAI College – Centre of education". SEDAMAI College. Archived from the original on 21 June 2014. Retrieved 16 July 2015. ^ "Bintulu flying academy gaining attention from nearby countries". The Star (Malaysia). 31 January 2008. Archived from the original on 16 July 2015. Retrieved 16 July 2015. ^ "Govt urged to intervene in closing of aviation school". The Borneo Post. 17 May 2012. Archived from the original on 16 July 2015. Retrieved 16 July 2015. ^ "Bintulu – Public Library". isarawak.com.my. Archived from the original on 2 January 2011. Retrieved 18 July 2015. ^ Yussop, Mahmud. "Old Bintulu Library". blogspot.com. Archived from the original on 18 July 2015. Retrieved 18 July 2015. ^ "Introduction to Bintulu Development Authority Library". librarynet.com.my. Archived from the original on 23 November 2014. Retrieved 18 July 2015. ^ "Council Negri Memorial". Sarawak Tourism Board. Archived from the original on 15 July 2015. Retrieved 19 July 2015. ^ "Borneo International Kite Festival 2015". Sarawak Tourism Board. Archived from the original on 16 July 2015. Retrieved 19 July 2015. ^ "Borneo International Kite Festival". Lonely Planet. Archived from the original on 10 October 2014. Retrieved 19 July 2015. ^ "Similajau National Park". Sarawak Forestry Department. Archived from the original on 22 November 2014. Retrieved 19 July 2015. ^ "Lambir Hills National Park". tourism.gov.my. Archived from the original on 19 July 2015. Retrieved 19 July 2015. ^ "Niah Cave". tourist-attractions-in-Malaysia.com. Archived from the original on 23 July 2012. Retrieved 3 September 2016. ^ "Sarawak ~ National parks". go2travelmalaysia.com. Archived from the original on 4 January 2014. Retrieved 19 July 2015. ^ "Tanjung Batu or Temasya beach Bintulu". Archived from the original on 19 July 2015. Retrieved 19 July 2015. ^ a b c d e "Bintulu Tourist Attractions.. An IDEAL rest and Relax vacation destinations". sarawak-vacation-destinations.com. Archived from the original on 23 June 2013. Retrieved 19 July 2015. ^ "Kidurong Tower". Sarawak Tourism Board. Archived from the original on 2 April 2015. Retrieved 19 July 2015. ^ "Bintulu tourism". Bintulu Development Authority. Archived from the original on 18 July 2015. Retrieved 19 July 2015. ^ "Shopping". Bintulu Development Authority. Archived from the original on 19 July 2015. Retrieved 19 July 2015. ^ "Time Square Megamall". Time Square Megamall. Archived from the original on 14 August 2013. Retrieved 19 July 2015. ^ "Pasar Tamu & Pasar Utama Bintulu". Sarawak Tourism Board. Archived from the original on 15 July 2015. Retrieved 19 July 2015. ^ Goh, Kenneth. "Grilled Glutinous Rice Package–Pulut Panggang (糯米虾米卷）". wordpress.com. Archived from the original on 1 April 2015. Retrieved 19 July 2015. Wikimedia Commons has media related to Bintulu.